Niesamowity custom Dunny – Max z gry video SAM&MAX. Pomalowany przez Porlzilla. Chcemy go! 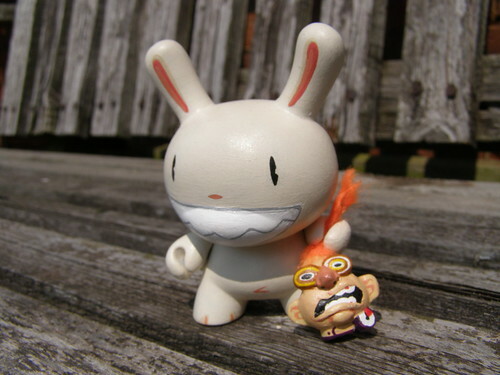 This entry was written by Jot, posted on 30/06/2010 at 17:59, filed under Designer Toys, Foto and tagged custom, dunny, sam&max. Leave a comment or view the discussion at the permalink and follow any comments with the RSS feed for this post. This entry was written by Jot, posted on at 11:15, filed under Designer Toys, Foto, Nasza kolekcja and tagged bonass, kubrick, mist, plastic. Leave a comment or view the discussion at the permalink and follow any comments with the RSS feed for this post. This entry was written by Jot, posted on at 10:00, filed under Designer Toys, Foto, Media, Wystawy and tagged warszawa, wystawa. Leave a comment or view the discussion at the permalink and follow any comments with the RSS feed for this post. Ciekawa nieoficjalna wersja Dunny oferowana przez Sucklord, dostępna tutaj. This entry was written by Jot, posted on at 08:30, filed under Designer Toys, Foto and tagged dunny, suckadelic, sucklord. Leave a comment or view the discussion at the permalink and follow any comments with the RSS feed for this post. Niestety nie w Polsce. The Aldrich Contemporary Art Museum w USA wystawia pierwszą solową wystawę Brooklińskiego artysty Briana Donnelly’ego znanego jako KAWS. Więcej zdjęć z wystawy dostępne tutaj i tutaj [FeshnessMag]. This entry was written by Jot, posted on 29/06/2010 at 13:15, filed under Designer Toys, Foto, Wystawy and tagged kaws, wystawa, zagranico. Leave a comment or view the discussion at the permalink and follow any comments with the RSS feed for this post. This entry was written by Jot, posted on at 08:57, filed under Designer Toys, Foto and tagged 100%, bearbrick, colette, medicom, ren&stimpy. Leave a comment or view the discussion at the permalink and follow any comments with the RSS feed for this post. Zaprzyjaźniony ptaszek z Ace Film Festival. Polecił nam film emitowany w tegorocznej edycji festiwalu: The Vinyl Frontier. Wywiady i perspektywy na scenę designer toys wielu największych nazwisk w środowisku. This entry was written by Jot, posted on 28/06/2010 at 19:42, filed under Designer Toys, Media, Video and tagged acefest, media, video, vinyl frontier. Leave a comment or view the discussion at the permalink and follow any comments with the RSS feed for this post. This entry was written by Jot, posted on at 13:06, filed under Designer Toys, Media and tagged media, prasa, toys. Leave a comment or view the discussion at the permalink and follow any comments with the RSS feed for this post. Niesamowity custom MUNNY pomalowany przez Grimsheep na konkurs MUNNY MUNTH. This entry was written by Jot, posted on 25/06/2010 at 13:58, filed under Designer Toys, Foto and tagged custom, kidrobot, munny. Leave a comment or view the discussion at the permalink and follow any comments with the RSS feed for this post.